Hey everybody, Scott here with Motivated Code Pro. Thanks for coming back today. This is part five of a six part series. Today we’re going to talk about your CPA and legal representation. Stay with me. Thanks for coming back. If you’re going the road of becoming a consultant or starting a consultancy. Building a partnership, a business with fellow technology people. You’re a solopreneur. You’re a one-man band with a microphone. Whatever you’re doing, you’re self-employed. You are a business. And as a business, you need the representation of a CPA and a good business attorney. Why do you need those things? There are so many things that go on in your business beyond you and your hands on the keyboard. A good CPA is going to help you with everything from your corporate designation. Are you an LLC, a sole proprietorship, are you an S Corp or you a C Corp.
And your CPA can help you with those and will and should help you with that. And will help you change designations as your situation warrants as you move on. And so the time to have a CPA on your team and I really want you to think yourself, even if it’s just you to begin with, as a team. And your team needs key players, right? Your CPA is one. You might say your health insurance provider is another but I’m not going to talk about that at the moment. Your legal representation or your business attorney is another. And those are all very, very important things. But particularly with the CPA has been so important to us. Anything that happens with the IRS, your CPA can represent you. It’s not just an accountant or a bookkeeper. It’s a certified public accountant and it’s very, very important. They can help you with everything from, like I said, your corporate designation, payroll and direct deposit, 401k for your employees if you have them or when you have them. They can help you with a lot that. Here’s another thing that I do with my CPA all the time or with our CPA. We need to buy X equipment. Should I buy it in December or should I wait until next year to buy it? Is X thing deductible? That’s another good question. They usually are keeping their eye on your cash flow in addition to you, of course, are keeping your eye on your cash flow too. But you can … Hey, do I have the resources to finance X thing? To purchase X thing? To hire somebody as a W-2 employee or to bring somebody on as a 1099 contractor or do a corp to corp with somebody else. Well, you don’t want to take on the responsibility of being your own CPA in the interest of trying to save money because it’s a bad move. You are a software professional. Your expertise is in building code. Helping customers to design processes and systems. You do not need to be sitting around with an Excel spreadsheet or bank statements and ledgers and all of the accounting-related stuff. It’s a waste of your time. And you’re not an expert nor do you have the expertise unless you really are an accountant. 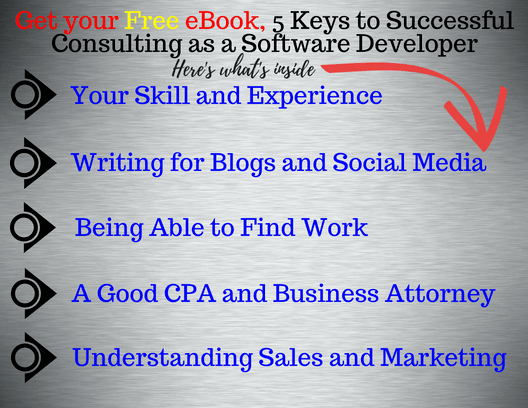 Even then I would tell you if you’re going to be in the software business, you’re going to be a consultancy, have the business savvy and the business sense to bring on somebody that’s an experienced CPA. The other thing I want to say about the CPA that’s so, so important is that you need to like this person because we had a CPA in the past and every time the phone rang, it would just make my stomach just crunch up. It was difficult for me to deal with her. I learned later when we had a new CPA, what the difference is like breathing underwater versus bringing in the nice blue sky. Every time I had to deal with this first person, it was a gut-wrenching experience. She expected me to know things I didn’t know. I’m not an accountant. I’ve worked in corporate. I understand their accounting a lot better than I understand mine, right, as a small business. Don’t be fooled into thinking that you could or should do that. Be smart. Don’t be your own accountant. And with a business attorney, this is important too. Whenever you get into anything contract and you need boiler plates for contractor agreements, subcontractor agreements, nondisclosure agreements, intellectual property issues that you might encounter. Anything to do with product and exposure to somebody else’s product and all that. I think it’s always a good to have somebody that you can balance ideas off of and that you can show documentation to in the form of what somebody else is giving you as a contract. Or what you’re going to offer to somebody else in particular. Those are good places for your attorney. And a lot of times in our experience I could sell into an engagement with somebody and they say, “We’ll send you the contact.” You’re like, oh okay. Well and at other times somebody will say, “Okay, yeah, let’s do this deal together. Send me a contact or send me an agreement.” And then what do you do? Well you go out to the internet and find the best thing that you can find which could be a train wreck and could be a real legal heartache for you in the future. It’s worth spending some money upfront to spend some time with a qualified business attorney who understands what you’re doing. Man, these things are really, really important. These are I’s you need dot and T’s you need to cross so you’re not overwhelmed later by the fact that you missed these details and now you’re going to get hurt in some negotiation or on some contract or money isn’t coming because you missed something. So really, really important. Don’t try that yourself either. You’re not an attorney and again I’ll say even if you are an attorney and you’re trying to be in the software business, I don’t think … the doctor doesn’t do surgery on himself. So I don’t think that you should try to be your own accountant or your own attorney. So that’s it. Those are some key things about your business partner. The people that you want to have on your business team. Again, your CPA And your attorney or legal representation. A lot of times those people will know each other and that’s really helpful. That’s been true for us. The attorney and attorneys that we’ve used have known and been connected to our accountancies. And the last thing I want to say about all of that is those people particularly your CPA, he or she knows everybody in town. They have access to resources that you can’t even think of probably right off the top of your head. And they’re just good. And if you can like that person, I’ll say that’s a requirement. You need to like your CPA. You need to like your business attorney too. So that’s it for today. I am Scott with motivatedcodepro.com. Go out to the blog. Check out the blog post for this section. This is number five. Or, go sign up and I’ll send you the e-book that has all six of these sections in the e-book. Again, like subscribe and hit the bell so you don’t miss any videos and keep coming back.